The number of reported cases of disease from mosquito, tick, and flea bites has more than tripled in recent years, according to a new reportfrom the Centers for Disease Control and Prevention. The report collected available data on vector-borne diseases through the National Notifiable Diseases Surveillance System from 2004 to 2016. Over the course of 13 years, more than 640,000 cases of 16 insect-borne diseases—such as Lyme, Rocky Mountain spotted fever, West Nile, and Zika—have been reported in the US. The number of cases reported jumped from 27,388 in 2004 to more than 96,000 in 2016, with a big jump from 2015 to 2016 alone. We’re not just talking about itchy, red bumps that make you not want to wear shorts. These insect bites can lead to serious illnesses which can require hospitalization and be life-threatening. In the case of Zika, even unborn babies can develop birth defects from the virus. Source: Rosenberg R, et al. 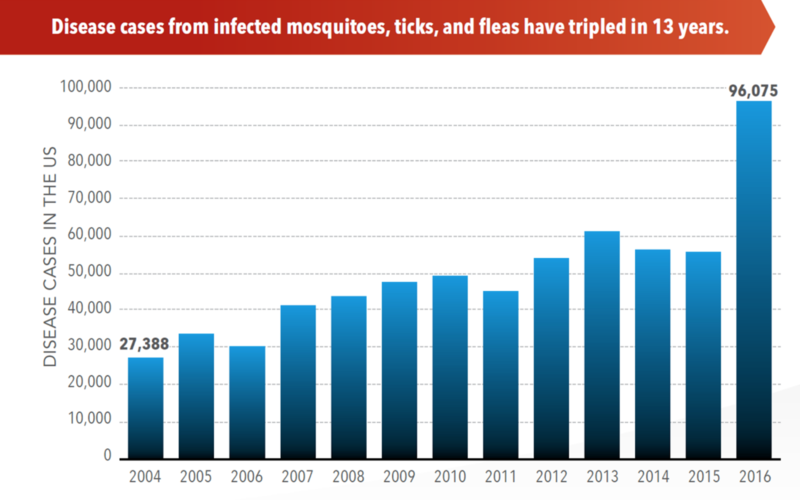 Trends in Reported Vector-Borne Disease Cases—United States and U.S. Territories, 2004-2016. But these flying, crawling, and burrowing creatures could actually be affecting us at a higher rate than reported: Officials say the actual number of people who’ve become sick due to insect-borne illness is much higher, since many infections are left unreported or unrecognized. Plus, summer is just around the corner, and warm weather only exacerbates insect activity. Here’s what you need to know to about each of the six- to eight-legged creatures, how to protect yourself from infection, and what to do if you actually get bitten. Getting one swollen, red bite doesn’t mean you have Zika or West Nile, and dousing yourself in DEET probably isn’t the most effective way to avoid bites (that would be avoiding mosquitoes altogether, which, good luck). Most mosquito-borne diseases are a result of travel. Commerce (and your trips to the tropics) move mosquitoes around the world, bringing new germs into unexposed areas of the US. But the CDC doesn’t suggest halting your travel plans altogether, rather it says that precautions need to be taken both in and out of the country. The CDC urges people to use an Environmental Protection Agency (EPA)-registered insect repellent—which all include one active ingredient such as DEET, Picaridin IR3535, oil of lemon eucalyptus, or 2-undecanone. These repellants should be applied as directed (please don’t spray repellent on the skin under clothing and if you’re also using sunscreen, apply that first and insect repellent second.) While it may not always be in your best interest to wear long-sleeved shirts and long pants in 90-degree weather, wearing such an outfit does help minimize the risk of a bite. You also should take steps to control mosquitoes both inside and outside of the home. The CDC recommends routinely scrubbing, covering, or throwing out items that hold water—think flower pots, trash containers, or pools—since mosquitoes lay eggs around water. They also encourage using screens on windows and doors. If you do find yourself swatting off one of these insects a little too late, avoid scratching the bump to help prevent infection. If after getting a mosquito bite you experience fever, headache, or body aches, you should contact your doctor. According to the recent CDC report, ticks now account for nearly 77 percent of insect-borne illnesses since 2004. Disease cases from ticks have doubled since 2004—thanks to the introduction of seven new germs responsible for the newly discovered Heartland and Bourbon viruses. And Lyme disease accounts for 82 percent of all tick-borne cases. Ticks love wooded and brushy areas with high grass and leaf litter, so if you like to hike, stick to the center of the trails. Similar to their advice for preventing mosquito bites, the CDC recommends using the same type of insect repellants to avoid ticks when participating in any outdoor activities. Once you return home, the agency says you should bathe or shower as soon as possible to wash off any free-loaders that might have latched onto you. Tumble drying your clothes on high heat for 10 minutes can also ensure that no ticks find their way into your home. You should also conduct a full-body check with a mirror, paying extra attention to your underarms, in and around your ears, inside your belly button, between your legs, and especially your hair. Be sure to check your dog, too, if he joined you on the hike, as well as any packs you carried. If you do find a tick on your skin holding on for dear life, use a pair of fine-tipped tweezers to grab the tick as close to the skin as possible. Pull upwards with steady pressure. After disposing of the tick by any means except crushing it with your fingers, clean the bite and your hands with rubbing alcohol or soap and water. If you develop a rash, fever, or aches several weeks after removing the tick, the CDC says you should see a doctor. Plague is the bacterial infection transmitted by fleas to humans, after a flea has bitten an infected rodent. The plague only affects about 5,000 people a year worldwide, but it can be fatal if not treated promptly with antibiotics. While the risk of developing plague is pretty low, Mayo Clinic recommends taking certain precautions if you spend a lot of time outdoors. Rodent proofing your home is extremely important. It can be done by removing piles of brush and firewood, as well as ensuring any pet food is properly stored. Your pets could be at risk too, so be sure to apply flea products routinely. Unfortunately, if you live in an area where plague is more common like California, Arizona, Colorado, and New Mexico, the CDC says you probably shouldn’t let your fur babies sleep in your bed. If you develop symptoms such as swollen lymph nodes, high fever, and extreme exhaustion, it is highly recommended you see a health care provider immediately for antibiotics.